Garden Lodge01485 534411work01485 534724fax Self-cateringOur recently built Garden Lodge is located in the grounds of the Le Strange Arms Hotel and has three individual en-suite bedrooms. 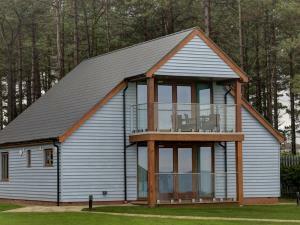 The two storey lodge has been designed to make the most of the magnificent sea views and offer guests a home from home with an open plan kitchen, lounge and dining area. Outside seating overlooking the lawn is an ideal spot from which to enjoy the magnificent North West Norfolk coast. On the first floor you will find the master bedroom with its king size bed, en-suite bathroom and seating area and doors leading onto a private balcony with a stunning view of the coast. On the ground floor are two en-suite bedrooms which can be configured as either double or twin rooms. Open plan kitchen, lounge and dining area. Kitchenette comprising of 4 ring hob, oven, microwave, fridge, kettle and toaster. Desk and seating area in each bedroom. Our recently built Garden Lodge is located in the grounds of the Le Strange Arms Hotel and has three individual en-suite bedrooms. Guests are able to use the facilities in the Le Strange Arms Hotel.